An AMC or Annual Maintenance Contract is an insurance for all of your expensive IT infrastructure which is extremely essential to keep your business running smoothly without interruptions. Your infrastructure is the backbone of your organization. All your data, your processes, details of your clients, billings, project schedules and anything else which is essential to keep your business running depends upon your capacity to keep your IT infrastructure up and running without any issues. An AMC gives you the peace of mind and comfort of knowing that any problem which arises will be managed and handled by professionals who know what they are doing. However, you do need to ascertain that the professionals to whom you hand over the responsibility of maintaining and taking care of your most valuable assets are qualified enough to do so. It does make sense, clearly, to go with the best people in this field, with years of experience and a qualified team which has been hand-picked and trained extensively to maintain lofty standards. And we, at VRS Tech are the best providers of AMC in Dubai. We understand that problems can crop up anytime without any warning. This is why, we at VRS Tech offer you consistent and prompt maintenance service all through, whenever you require them. Our team of experts is always there to resolve your issues promptly and troubleshoot the problem onsite, available for you 24×7. We give equal priority to all kinds of IT issues. In addition to solving the issue, our experts get out of their way to prescribe preventive measures to our clients at pre-defined intervals which increases the life and serviceability of your infrastructure thereby reducing the number of issues, because prevention is always better than cure. We understand and appreciate the fact that you are entrusting us with the lifeline of your company. That is exactly why we take our work so seriously. We are not satisfied with just solving your issues, but are more interested in ensuring that you attain peace of mind by conducting routine checks and diagnostic processes to prevent issues from occurring. 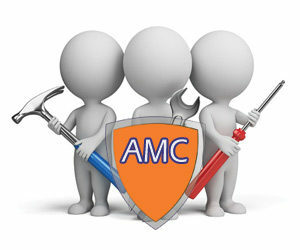 Due to our dedication to service, highly qualified team and fairly priced AMC, Dubai has loved us and given us the top position in this field since several years.We cover all your breakdowns (computer systems, networks and peripherals) and malfunctions, and your computer equipment will be kept at optimal performance throughout the year by our onsite technical team. Choose us and rest easy! Contact us today!